Stuffing things with other things could be one of my favorite things. To do. Let’s shed some light on stuffers and stuffees. Crepes. Best stuffee of all time if you want me to give it to you straight. The savory crepe, the sweet crepe, the crepe that’s stuffed with nothing but melted chocolate. The only French food I have ever made. Turduckin. Duh. Stuff an animal with another animal which is stuffed with an animal. That’s multi-tasking. That’s cooking in bulk. That’s protein. Deviled eggs. Stuffing something with itself is kinda cool, admit it. And the bell pepper! Oh the possibilities… various meats, grains, and vegetables. 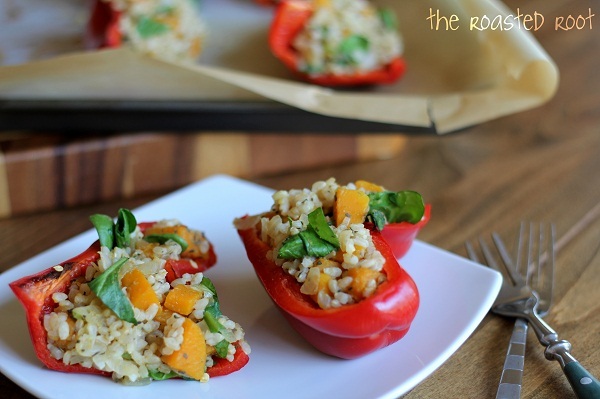 These brown rice and butternut squash stuffed bell peppers are seasoned with warm spices and a little kick. 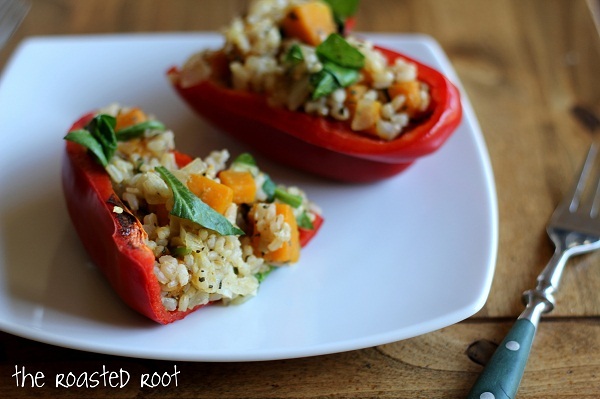 They’re simple, healthy, have great flavor and when in doubt, you can always add cheese! 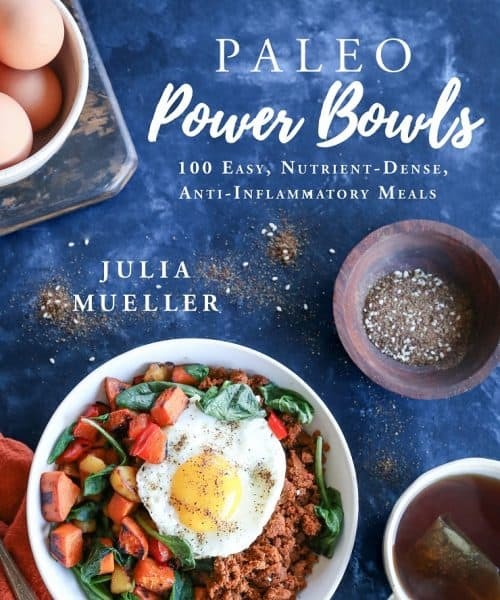 Prepare your brown rice as it states on the package. I use a 2:1 ratio of water to rice, boil the water and let the rice simmer for 35 – 45 minutes. Heat the grapeseed oil over medium heat in a large skillet. Add chopped butternut squash, stir to coat with oil, cover the skillet and cook for 5 minutes. Remove the cover and add the 2 tablespoons of stock/water. Replace the cover, cook an additional 2 to 3 minutes. Add the yellow onion, cumin, coriander, garlic powder, fennel seeds and salt. Stir and sauté an additional 8 minutes until butternut squash is soft and all the water has evaporated. When rice is finished cooking, add the rice and the chopped spinach to the skillet with the butternut squash. Stir well and set aside. 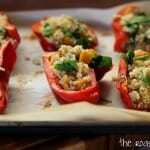 Cut the bell peppers length-wise, remove their insides and place cut-side down on a parchment-lined baking sheet. Bake in the oven for 5 minutes. 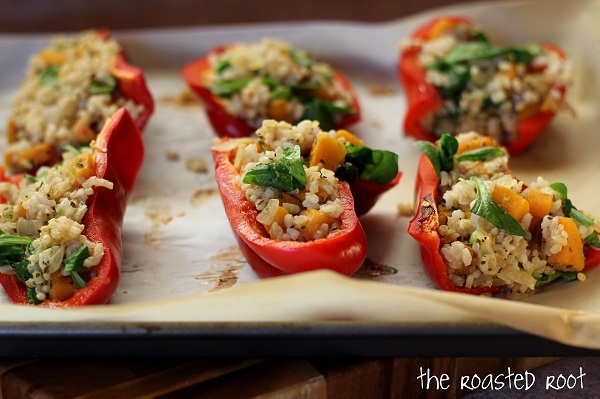 Remove peppers from the oven, allow them to cool and then flip them over (cut-side up) and stuff them with the stuffing, loading them up to the max (you may have a little leftover butternut squash stuffing). 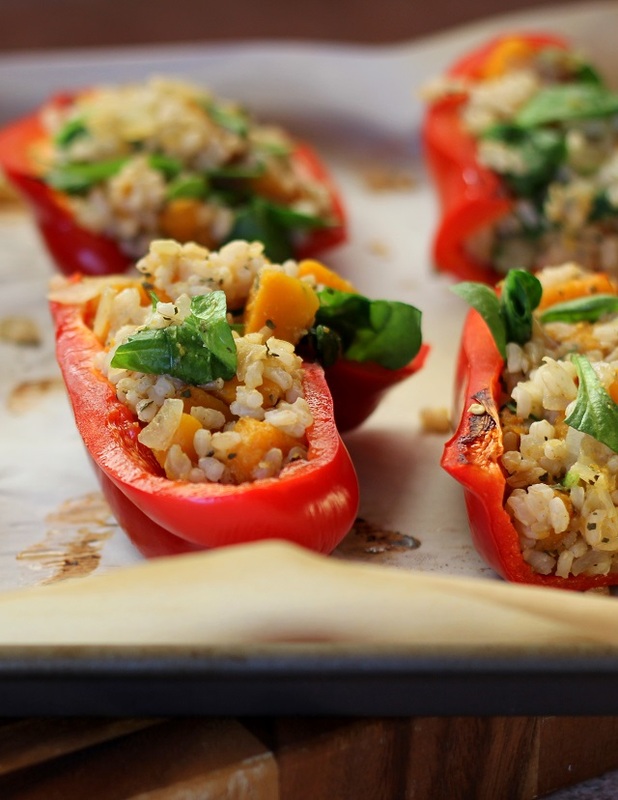 Bake the stuffed peppers for 7 minutes then remove and serve with your favorite meal!